Can “Addicts” and “Alcoholics” Solve Their Addiction at Home? Over the past 84 years (since the founding of the first 12 step cult, Alcoholics Anonymous), people who struggle with addictions have been told they must attend a rehab, or at the very least they must attend daily support meetings to get past their struggles with substances. While I wouldn’t argue that some folks can benefit by removing themselves from the chaotic circumstances of their tattered lives to get a better footing, I’d argue that this is a small minority of those seeking to change their lives. I’d also point out that what is being taught in rehab today is harmful and counterproductive. 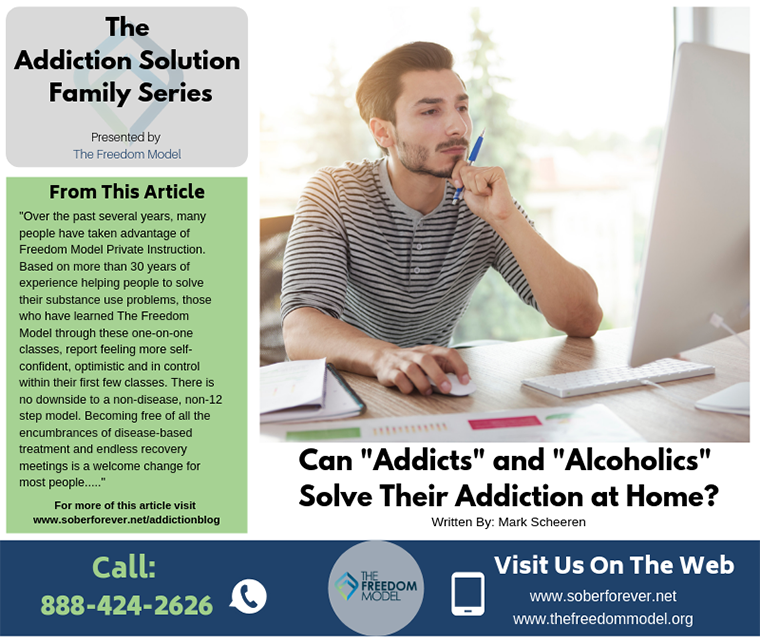 So even when the decision to go to rehab is made, the individual is entering a counterproductive model, and likely will continue to struggling with their addiction in the future as a direct result of the addiction mythology they learn while in rehab. If you doubt this fact, take some time and read our book, The Freedom Model for Addictions. In it you will find supporting documentation and research that corroborates our stance that addiction treatment is an abysmal failure, and that there is a much more effective solution. Most people do not need to leave their lives behind to move past addiction. We know this to be true because more than 90% of people who struggle with alcohol, marijuana, methamphetamine, cocaine and/or opiates stop, whether they are treated or not. The simplest explanation for this consistent phenomenon is that people change their preferences for drugs and alcohol as they age and most do so on their own quite naturally. Demographically heavy substance use peaks between the ages of 18 and 24 and then drops off as a function of age; the older you get the more people moderate or abstain. Regardless, substance use is one of the leading causes of accidental death in the 18 to 24 year old demographic as a result of their heavy use. All substance use carries risk, so the real question is – what method or model can shorten the tenure of a person’s substance use habit so the rate of tragedy in this population gets lowered? If we are to be truly helpful, that is the crucial question. Because we know the natural remission rate is so high, while also knowing that the risks of active use are high as well, then it makes sense that we would seek to reduce some of the risks of use as well as shorten the duration of use. In other words, educate people so their use provides as little risk as possible, while also not hindering the natural preference change that happens during as a result of maturation. That’s the goal of The Freedom Model; to provide researched options for anyone with a substance use issue, whether they are at the beginning of their use cycle, the middle, or near the end of it. By providing the correct researched information that speeds up the choice of moderating or abstaining, we are averting most of the pain and misery that comes with long term unfettered use. This goal led us to address a very important factor – most people will never go to a rehab, (which, as we stated, is not a bad thing) yet they might struggle needlessly because they’ve already learned and believe damaging rhetoric from our misinformed, disease-based cultural view on addiction and recovery. Virtually all of this false disease-centered rhetoric is harmful and keeps people trapped and distracted from making positive changes in their substance use habits. We know that some people feel they need to get away to gain a new perspective and break the self-destructive cycle of addiction. We have helped thousands in this population for nearly 30 years at our non-12 step residential retreat, The Freedom Model Retreat (we have the distinction of being the creators of the first non-12 step residential model in the world). However, we also know there are many more people who want or need to remain home to raise their children or continue to go to college or work. They cannot take the time away to go to our retreat. That is why we wrote The Freedom Model for Addictions book, and offer a one-on-one video conference series of classes. This allows for this population to work through The Freedom Model from the comfort and privacy of home with the help of a certified Freedom Model Instructor, while keeping up with their responsibilities. Try to remember, when we factor in age, nearly everyone moves completely past their addiction issues. The Freedom Model Private Instruction can speed up this natural change thus reducing the risks that come with heavy, long term use. We have been offering this world-changing paradigm for nearly a decade and people absolutely love it! Over the past several years, many people have taken advantage of Freedom Model Private Instruction. Based on more than 30 years of experience helping people to solve their substance use problems, those who have learned The Freedom Model through these one-on-one classes, report feeling more self-confident, optimistic and in control within their first few classes. There is no downside to a non-disease, non-12 step model. Becoming free of all the encumbrances of disease-based treatment and endless recovery meetings is a welcome change for most people. So if you need help with an addiction, but you cannot see yourself “going to rehab” or you don’t feel you need or can take the time for a residential retreat, then know that there is a solution for you. 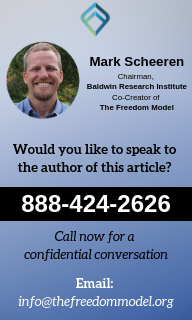 Take a moment, and go to www.thefreedommodel.org or call 888-424-2626 and learn more about our at home private instruction. 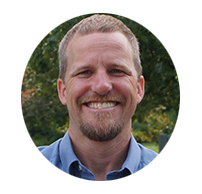 One-on-one classes with world-renowned addiction expert, Mr. Steven Slate, coupled with our Freedom Model curriculum just might be the non-12 step model you’ve been seeking!